With the First RAT, we introduce to you the Rankie's Meter. 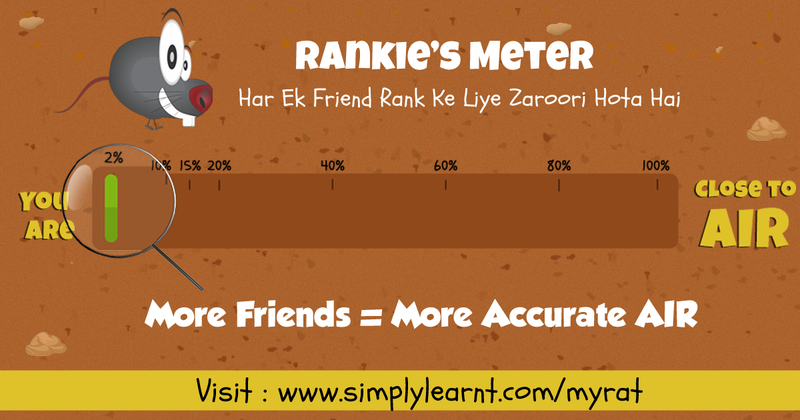 The higher your Rankie's Meter, the more accurate will be your All India Rank. Here is all you need to know about your Rankie's Meter! The idea is simple you invite your friends to take the First RAT along with you. If they register, only then your Rankie's Meter increase. This is what you get by default when you register. This means that when you get your final rank it will be among 10,000 students (of lakhs of students) who will give the entrance exam after Class 12th. Even if more than 10,000 students will appear for the First RAT, your rank will be as good as among 10,000. Of course, you need more accurate rank. What to do? Start inviting your friends (of same class) to take this test. Since 1 of your invited friend registered for RAT, your Rankie's Meter will be at 10% i.e. your rank will be calculated among 50,000 students. Since 2 of your invited friends registered for RAT, your Rankie's Meter will be at 20% i.e. your rank will be calculated among 75,000 students. Since 3 of your invited friends registered for RAT, your Rankie's Meter will be at 20% i.e. your rank will be calculated among 100,000 students. If 15 friends of your friends join then your ranking will be calculated at the All India Level. This is 100% of Rankie's Meter. Wow! After signing up for RAT, visit your RAT home page. Share it on Facebook, twitter, send out emails, whatsapp messages, phone calls! what not? So stop thinking as RAT is in 2 days, start inviting your friends right away.